Flesh Diamonds. - Holly Lay. Modern fame often appropriates previous icons. In history famous figures often were based off of myths and had creation stories i.e. Aphrodite. Modern celebrities also have personal myths, with their own creation stories about their rise to stardom. They become a glamourous icon worshipped by the masses. Celebrities are an amalgam of the past and reflection of the present. They continue to move and speak after death. 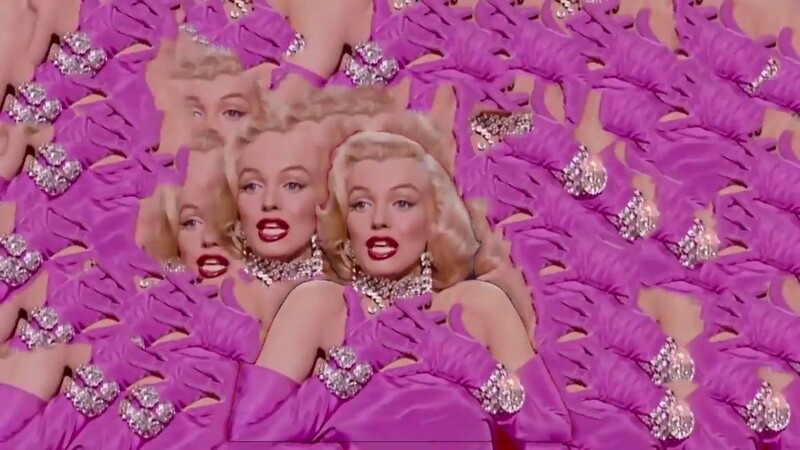 Flesh Diamonds takes one of the most replicated scenes in film history and shows its repetition throughout time, each star projecting their own identity. They have been manipulated with algorithms based off of the movement each icon contributed to their version of Diamonds Are a Girl’s Best Friend bringing out the materiality and motion of the celebrities’ filmed persona.